Courtesy of PRO-formance Realty Concepts. Many extras included in this immaculate, N/S facing Hampton Model. This home boasts custom built-ins in Office, Great Room & Master Bdr, all with indirect lighting/display shelving. 2 Master suites with en-suites & extended 3rd bedroom. Granite counters, SS appliances, under cabinet lighting in spacious Kitchen. Shutters T/O. Extended patio retreat has built-in BBQ with seating area, triple rock waterfall, electric shades, and views of Cimarron #14 & #15. Fully insulated 3 car extended garage with A/C & Heat, 55′ of storage cabinets, door openers (WIFI) can be set to close automatically. Attic has 300 Sq.Ft of floored & lit storage space. Energy Conservation pkg; Radiant Barrier Roof Sheathing. See Document tab for items that convey & historical list of upgrades & improvements. Directions: South on Sunrise, Right on Mountain View to Oracle Rim, Left on Oracle Rim. Immediate Left on Bear Canyon Ct. Approximate size: 14068.00 sq. ft. Please, send me more information on this property: MLS# 5881561 – $644,000 – 20574 N Bear Canyon Court, Surprise, AZ 85387. 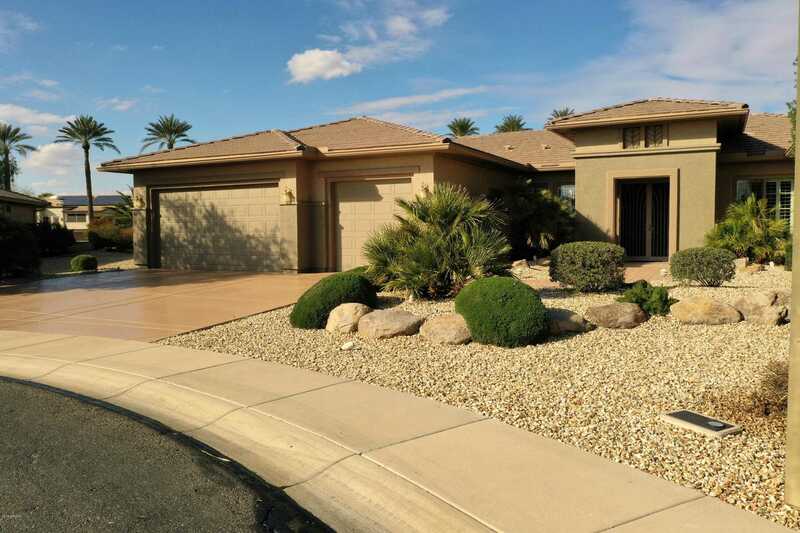 I would like to schedule a private showing for this property: MLS# 5881561 – $644,000 – 20574 N Bear Canyon Court, Surprise, AZ 85387.